SANTA CLARA, Calif. (KGO) -- San Francisco 49ers linebacker NaVorro Bowman will undergo season-ending surgery to repair a ruptured Achillles tendon, the team announced Monday. Bowman, 28, suffered a lower leg injury midway through the third quarter of Sunday's 24-17 loss to the Dallas Cowboys and did not return to the game. #49ers LB @NBowman53 suffered a season-ending Achilles injury in Week 4 loss to Dallas Cowboys. After the game, Bowman did not speak to reporters and coach Chip Kelly did not have a further update, but the fear was that Bowman had an Achilles injury. Bowman's teammates also weren't sure of the extent of the injury, but they feared the worst. "It stinks," tackle Joe Staley said. "It's really, really bad. NaVorro is a captain for us, one of our team leaders. We're going to have to have a guy step up. That's a huge role to fill. You can't really replace a guy like NaVorro, but we have to have guys step up and be ready to go." Bowman went down with about six minutes, 10 seconds left in the third quarter on what appeared to be a noncontact injury. Bowman immediately sat up and began pointing at his left leg and ankle. San Francisco medical personnel helped Bowman off the field and to the sideline, where he attempted to test the leg. After a few minutes, a cart brought Bowman to the locker room for further examinations. Bowman had eight tackles and a sack in Sunday's game before departing with the injury. Bowman suffered a torn ACL and MCL in the NFC Championship Game after the 2013 season, and he missed the entire 2014 season. He returned last year and earned All-Pro honors for his league-leading 154 tackles. Early in this year's training camp, the 49ers signed Bowman to a four-year contract extension that could keep him with the team through the 2022 season. Nick Bellore replaced Bowman in the lineup Sunday. For more stories related to the San Francisco 49ers, click here. Devastating news for #49ers. 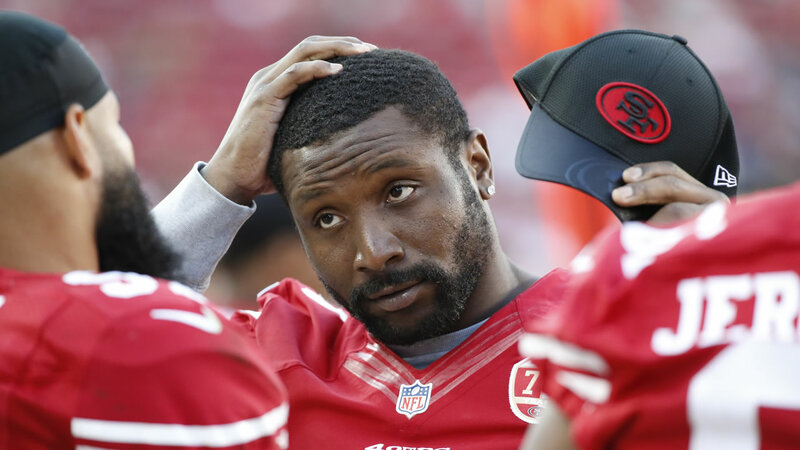 NaVorro Bowman is out for season with Achilles' tendon injury.